On 9/11 no hurricanes anywhere on earth, but there are still “Acts of God”. – Len Bilén's blog, a blog about faith, politics and the environment. On 9/11 no hurricanes anywhere on earth, but there are still “Acts of God”. The climate catastrophe prophets have predicted stronger and more frequent hurricanes. The first week of September is the peak of the hurricane season, and guess what? No hurricanes in the Atlantic, not even tropical depressions. In the Eastern Pacific: Tropical cyclone activity is not expected during the next 48 hours. In Honolulu, the Central Pacific Hurricane Center says: No tropical cyclones are expected through Sunday evening. There are no active tropical warnings in the Northwest Pacific/North Indian Ocean, Central/Eastern Pacific, or Southern Hemisphere at this time. So, there are no hurricanes , cyclones or typhoons anywhere on earth on the day of 9/11, the day of maximum hurricane activity for 2015. That doesn’t mean there are no “Acts of God” as defined by our insurance policies anywhere on earth. 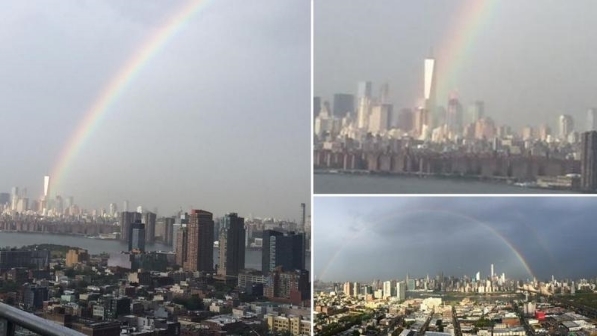 In a near desert land far away from all hurricane threats a strange rainstorm emerged on 9/11. 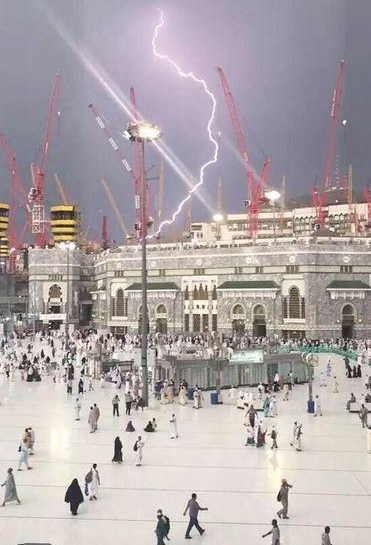 This occurred in Mecca, in the Grand Mosque no less, a freak thunderstorm toppled a giant crane and killed 107 ‘pilgrims’ and injured 238. The crane was owned by a German company, but the contract to expand the Grand Mosque to accommodate was run by the Bin Laden Family. And over Ground Zero a sign right before sunset on Sep 10. There are still Acts of God. Previous Previous post: The Iranian appeasement agreement. Quite an achievement! A Limerick. Next Next post: The boy and the clock and the White House invite. A Limerick.